We are into trading of High Quality Uniform Sarees. These designs are as per the latest fashion trends and in high demand. Please contact us for bulk orders only. We are into trading of High Quality Designer Sarees. These designs are as per the latest fashion trends and in high demand. 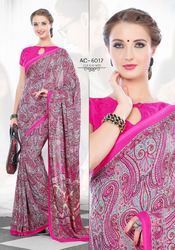 We are into traders of High Quality Designer Sarees. These designs are as per the latest fashion trends and in high demand. Looking for UNIFORMS SAREES ?